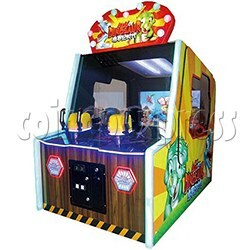 Age of Dinosaur Redemption Arcade Machine is a newly developed shooting games redemption machine, provides 2 players playing at the same time, features with simulating the graphic of age of dinosaur, adopts mechanical shooting way(no jamming, using dedicated balls) and suitable for every age player. It is a popular entertainment which by using the shooting handle to shoot the balls to win the output ticker within limited time. Age of Dinosaur Redemption Arcade Machine will be the most popular amusement machine for the amusement park players and it is essential for the park ride by its modern design, beautiful and colorful lighting effect, simple operation, safe and reliable. - shooting to get full of power within limited time will enter next level, the more power was got the more tickets will be won.